Somewhere on the interwebs I saw a really cute little thread catcher basket recently, but I can’t for the life of me find it now. At the time I looked all over and couldn’t find a pattern for it, thought “hmm, maybe sometime I’ll try winging it” and moved on. Today it occurred to me to go back and reread the darted tote section of the ikat bag series on bag-making, and you know what? 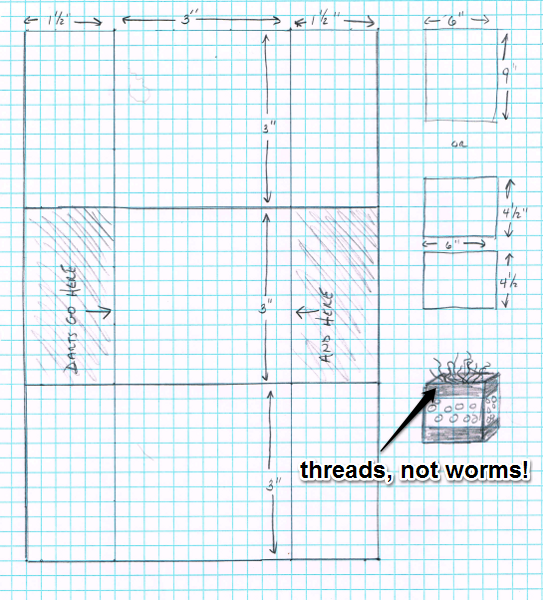 I can totally make a tiny darted tote. I’m sort of thinking strips of contrast color around the top and bottom and a bit of embroidery around the middle. Or something. We’ll see how it turns out. I also finally finished spinning the Shetland singles! Wound a plying ball last night, and I’m planning on getting started on the plying tonight. Of course I had a bunch less of one of the singles than the other two, so the big ball is three ply, and the smaller one is a two-ply ball with the leftovers. The ball of leftovers isn’t nearly as big as it looks — the three ply ball isn’t wound around anything, but the little one is wound around a mini tennis ball. Those make winding balls so much easier for me, but when I started winding the ball for the three-ply all the mini tennis balls were in use seeing as I’d already given half of them to my feline overlords as tribute. Definitely need some more of those. 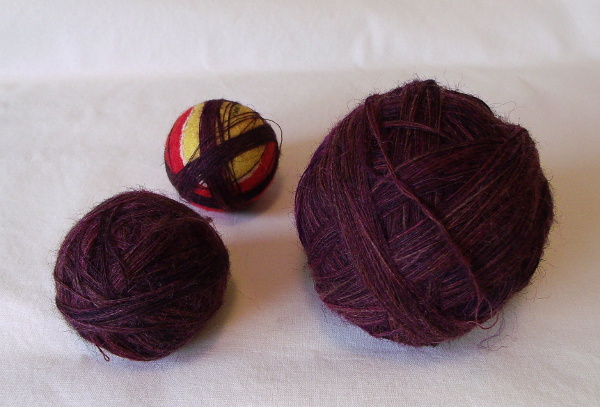 This plying ball was a lot easier to wind than any I’ve done before. Usually I wind the singles around toilet paper tubes, then use a makeshift shoebox lazy kate with knitting needles and the TP tubes, and inevitably a strand gets tangled around a knitting needle and it’s kind of a pain. This time I made three individual balls, stuck them in a bowl, and just wound from there, and it was pretty painless. And also sort of weirdly hilarious watching the yarn balls spinning hopping around the bowl.